From Paris to Ferguson, Mo. issues of race, police brutality and other tensions have been showcased throughout the world. As part of the Southern Illinois University Edwardsville Department of Mass Communications’ “Diversity Amidst Adversity” series, French journalist, filmmaker and human rights activist Rokhaya Diallo showcased her documentary, “Networks of Hate,” on Monday, April 3 in the Morris University Center. As a child of Senegalese parents, Diallo often found that her culture had become erased. People often asked Diallo about her place of origin, and when she replied Paris, many would be confused because of the color of her skin. Diallo drew comparisons from her research on police brutality of young Arab or black men in France, to what occurred following the death of Mike Brown in Ferguson, Mo. In “Networks of Hate,” Diallo talks about being attacked with hate speech on Twitter, how she pressed charges and the result of the final verdict. Along the way, Diallo also spotlights several cases of other violent verbal attacks toward politicians, feminists in the video game community, as well as hateful messages to a father whose son struggled with a horrible health condition. Following the documentary, the filmmaker answered questions ranging in topics from freedom of speech, Gamergate, cultural erasure, French colonialism, the power of social media and more. As a Jewish-American, Baltzer documented the desolate living conditions within Palestine while on assignment for the International Women’s Peace Service. “Anna also comes from a vibrant and unique background,” Ibroscheva said. “Her family escaped the atrocities of the Holocaust. Anna’s presentation was critical in providing a unique perspective into the plight of the Palestinian people during the Israeli-Palestinian Conflict. “Anna bridges the two perspectives as an Israeli-American, who has been transformed by what she’s seen on the ground and has documented,” Ibroscheva said. 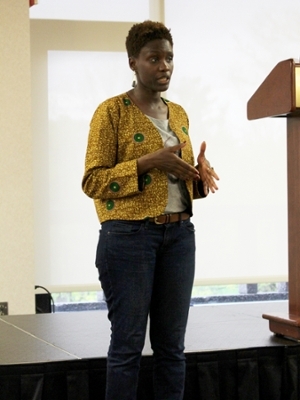 During the event, Diallo and Baltzer reflected on their experiences, diversity and activism.